OK, maybe not for real, but those in top political echelons would like it to be over already (particularly before ground troops are sent in). Barak, Livni, and friends proved their mettle. They're tough. They can defend Israel when politically expedient. Now let's get back to our regularly scheduled elections where Bibi can no longer call them laf-lafim (spineless, wishy-washy and irresolute) for letting all those rockets hit Israel without response. With publicly and anonymously attributed comments, those on top are making it clear that they don't want this war to continue on to victory. In a rare break from his usual silence (walk quietly and carry a big stick), Chief of Staff Gabi Ashkenazi completely distanced and disassociated himself from those remarks calling for a cease fire. Ashkenazi must be in shock. Here he is, with his army trained and poised to win (and actually winning), his chain released a few meters, and suddenly he is being yanked and reeled back in. Listening to the mixed messages coming from those currently on top of the political food chain it is clear that they don’t know what the goal of this war is supposed to be. There have been vague statements that everyone is free to interpret however they want. Meanwhile Gabi Ashkenazi wants to crush and obliterate the Hamas military and political infrastructure. That is his job as he understands it. The only problem is what comes next? Reinstating Fatah? A Civil Administration? Exiting and leaving behind anarchy and a vacuum? Any and all of those solutions are bad, and that is currently all that Barak and Livni can bring to the table, so instead they want a temporarily enfeebled and tranquilized Hamas. While the truth is that only by returning to Gaza, rebuilding our towns, and expelling any enemy and terror supporting inhabitants from this general territorial region will bring quiet and peace to Israel. And that is a declaration of failure for the entire ideology of the Left, particularly the Disengagement. And that is too expensive a price for victory. In a lot of ways this war is incredibly similar to the last Lebanon war, where the general consensus was that Israel lost. After all, we have much of the same leadership, massive numbers of Israelis (and Israeli towns and cities) are under missile threat and attack, we are running constant air sorties, the question has begun as to when to introduce ground troops, and the calls for Israel to cease fire (from the media, the left, and certain other politicized parties) has begun. Yet, despite all that, this time around I think the universal feeling is that we are winning. Chief of Staff Gabi Ashkenazi seems to have everything in hand and well prepared, and it is pretty clear to all that Hamas is losing. What a difference a ground forces RamatKal makes (as opposed to a pilot). Unfortunately, the government still hasn't clearly defined the goals of this campaign, and worse, the options they are probably considering are lousy - a temporarily weakened Hamas, regime change to Fatah, or an IDF Civil Administration - but no return to our towns. Someone might say they learned from the last war not to announce goals - but even amongst themselves? Meanwhile, the IDF is very angry at certain parties trying to influence their actions from the outside. In the final analysis, Olmert will come out of this with his reputation rehabilitated, while he manages to B-slap Livni yet again simply by asking Netanyahu to talk to the foreign press as an official government representative. Barak comes out looking good after Ashkenazi did all the hard work and planning for him. What actually ends up in Gaza, is still up in the air. With the war going on (and then again, also unrelated to the war), some of you may be interested in how you can help the people of Israel. There is a Jerusalem organization called Warm the Needy that does wonderful work. Every winter Warm the Needy helps thousands of poor Israeli families make it through the cold winter by supplying them with heaters/radiators and subsidizing their electric bills. If you are looking to help the People of Israel, then Warm the Needy is definitely a good place to start. With all the news going on today, there is one ray of hope that is shining through. The right wing parties have managed to get their acts together and unite under a single party. Yes, I'm ignoring the Mafdal Jewish Home as they will get their Bnei Akiva voters, and I'm ignoring Lieberman and his seven dwarfs, Uzi Landau and their Russian modeling agency who are getting Bibi's disgruntled former Likud voters. I'm talking about a right wing party that you can look at their list and say this is a party worth voting for. This is a party with ideals. This is a party of quality. To begin with, I want to thank and praise Baruch Marzel who showed true leadership, selflessness and dedication to the cause by putting aside his own ego and desires by willingly stepping aside to help put this list together - though I think Marzel in the Knesset would only have been an asset. I have nothing but respect for Marzel for this selfless act. What can I say. The man is a legend - as a settler, as a soldier, as a builder, as a person. I've met him a few times, and he is also a really nice guy. It never occurred to me that he should run as head of this party, or that he would even be interested. There is no question that this is the right party to vote for. It will be called Eretz Yisrael Shelanu - Our land of Israel. Without even seeing any polls I can definitely say that so far the big winner of this war is Ehud Barak. Riding on the coattails of Gabi Ashkenazi’s military planning, Barak (along with Livni) has delayed the Gaza offensive to as close to elections as he could possibly get away with. This has resulted in 2 good things for Barak. The first is that all the major parties have stopped their election campaigning, while Barak gets great face time as the Defense Minister – and can you beat that for free positive (and exclusive) campaigning ahead of elections? The second is that when the other parties realize they have been hoodwinked and renew their campaigns they will have to concentrate their attacks on Barak instead of Kadima v. Likud which will just give Barak even more legitimacy (and Barak has no where to go but up), but of course it will be difficult if not impossible to attack Barak in the middle of a war which he plans to finish only right before election time. If Bibi uses this war to get international face time explaining Israel’s position he faces a double edged sword. On one hand he seriously helps Barak (Barak wants to be Bibi’s Defense Minister if he can’t be Prime Minister) and on the other hand he helps himself. Livni of course will lose out, as she can’t compete with Bibi in the international media. Furthermore, Bibi can just explain that this is Barak’s show and Livni is a bystander, pushing up Barak more at Livni’s expense (Kadima was the bigger threat until yesterday). Livni can only come out ahead here if she somehow manages to pull some of the glory away from Barak and that is going to difficult because she is just the Foreign Minister and not a particularly good one. So far, Round One goes to Ehud Barak for delaying the defense of Israel until it would best help him in the elections. 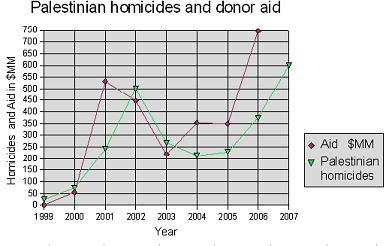 In October 2007 I discussed a study that seemed to have found a correlation between foreign aid to Palestinians and the number of murders they subsequently commit. 2007 had the highest amount of foreign aid, which implied that 2008 would have the highest amount of Palestinian murders. It was also noted that when stymied from killing Jews they turned on each other. A month or two ago I noted that they weren't reaching the expected number of homicides as predicted. Rereading the article I noticed something I had missed before. When studying the correlation, the author originally noted the correlation between increased foreign aid and increased violence. Specifically in the case of the Palestinians he chose successful murders as his violence index and in the article he appears to use both terms interchangeably. If we step back from solely using successful homicides as our violence index, but instead take into account attempted (not just successful) murders and terror attacks (specifically the number of rockets launched, and even while ignoring the amount of attempted murders in a mega strike), in that case his numbers make complete sense. Is it a war yet? Israel has finally decided to join the war in the South. Initiating what has been called a surprise attack (surprise, because no one thought for a second that this government would ever react to the continuing attacks against the country), it has given a decent enough first strike against Hamas targets. (I heard all the jets flying this morning and was wondering what that was about). But the questions are, what comes next, and what is the goal? Is the goal to achieve a short term quiet? To remove Hamas? To reinstate Fatah? To create a unified Palestinian Terror State whose goal is to replace Israel (one way or the other)? It certainly won't be to return our settlements or to remove the enemy population. Will this be an excuse to delay or cancel elections? (Already most of the major parties have announced they have stopped campaigning while the war is going on). Meanwhile Israeli Arabs (the ones in Israel) are busy rioting against Israel's actions. No surprise there. The next questions are, will Hizbollah join the fray, and what about the Arabs of Judea and Samaria. Stay tuned as we learn if this is for real, maneuvering ahead of elections, or even good for the Jews. Regardless, let's pray for the safety and success of our soldiers who are finally being given a chance to defend our country (and perhaps find Gilad Shalit). I'm posting updates over at the Muqata. How many times can I keep using the Chelm comparison? How strange is the Israeli. With rockets pounding the South and the Kadima led government frozen in fear while Labor's Barak opens up the Gaza crossings to food and money (and who knows what else), Kadima has bounced back in the polls and is beating the Likud 30 to 29! Did I Read This Right? So according to the JP, Bibi is trying to bring in Effy Eitam's party into the Likud. All the details are strange. The Likud gets Eitam's party's 12 million shekels, and the party gets a very low position on the list (most likely not enough to get into the Knesset). In the meantime, the person on the Likud list is not Eitam. What isn't being said is what is motiviating Eitam to destroy the remnants of his party. Most likely Eitam is horse trading the money for a Deputy Minister position (in which case he he doesn't need to be an MK). Whatever, the Likud doesn't look like much of an interesting party anymore. 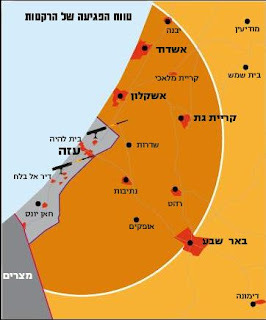 "Yisrael Hayom" published a map this morning showing the acknowledged depth of Hamas missiles launches from Gaza. What was interesting was how close the acknowledged depth is to settlements like Modiin and Beit Shemesh. What is more interesting is that the unacknowledged depth actually does reach them. I was discussing this with Jameel last night. 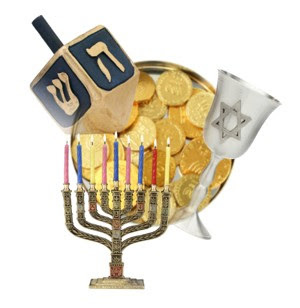 Do you give Presents or Chanukah Gelt? Anyway, growing up we usually got both (plus chocolate coins), but I think the presents had a bigger impact, after all, there was always that element of surprise and trying to figure out where your parents hid the gifts (plus in good years, there were 8 days of presents). Jameel feels that the whole presents think is too Xmasy, and he only does the Gelt. My kids are getting presents (toys, books, and puzzles). And we all eat Latkes! Dan Meridor is showing his true colors, and it makes you wonder what he is doing in the Likud. Meridor "is 'working very hard' and 'making every effort' to convince Binyamin Netanyahu to 'make history' by changing Israel's posture towards Syria and the idea of ceding the Golan Heights in return for a peace treaty." "Meridor, who supported Kadima in the previous election but recently rejoined Likud, told him he was 'working hard' to put together a Likud coalition with Labor and Kadima." "Meridor is considered very close to Supreme Court President Justice Dorit Beinisch. " So, this is what Bibi really wants for his Likud, and is why he brought Meridor in. You read it here first (on JoeSettler and the Muqata). Dozens of Israeli policemen were seriously injured today during a training exercise. The exercise was a simulation of a riot situation where the police were sent in to regain calm. Some policemen apparently were unable to differentiate between the real world where they are told to savagely beat protesters and a training exercise against their fellow policemen where they are not supposed to hurt anybody. Anyway, dozens of policemen found themselves on the receiving end of typical police violence commonly reserved just for settlers. Dozens of policemen (possibly as high as 54) are being treated for concussions and possibly broken bones after their fellow overenthusiastic policemen confused their training partners with settlers and beat them mercilessly. Also during the exercise another policeman fell asleep at the wheel while driving, injuring over 30 other policemen. Do you think there is a problem in the police force? There is talk that Aryeh Eldad may merge with Shalom Wolpe and Baruch Marzel. This would create the beginning of a RW Dream Team, which would be complete with Effy Eitam and Benny Elon. It would also get rid of the risk of running all these small RW parties where we all lose. btw, Who actually is going to be voting for Mafdal II? I couldn't find a bencher today (Beirchon, Grace after Meals, etc.) so I looked for one online and found this cute little site. Now I'm looking for Ma'ariv (Arvit, the Evening Prayers). The other day 2 idiots racing (each other?) to get into Jerusalem passed us at the entrance to the tunnels with oncoming traffic coming directly at us. They nearly got us all killed. Even in the tunnels they did that to cars ahead of them (and I saw that they had done that to the cars that were behind us along the way). Following that, they were so busy weaving in and around the other cars on the road, jockeying to get in front of everyone, that by the time we reached the red light on Derech Hebron, I was actually in front of them, simply by driving safely, sticking in my lane and going at the legal speed. Everyone in the car started laughing at them so they could see. That certainly annoyed them. With all their shenanigans on the road, and their inability to think more than one car ahead (much less anticipate what other drivers on the road were clearly doing), because of their weaving they kept getting stuck behind slower trucks. Meanwhile, as we reached the next red light, we and other drivers on the road were still ahead of them, and these idiots were fuming. And if they weren't enough of a danger before, they certainly were dangerous now. It is unfortunate that people like these two drivers are on the road. They are dangers to everyone else. In yesterday's Eilat accident it was discovered that the driver had 22 prior traffic convictions. 22! What was that guy still doing on the road? I am willing to bet, that these 2 idiots last week had a nice sum of tickets racked up between them. In fact, now that I'm thinking about it, in a lot of the major accidents the drivers had a large number of traffic convictions or their licenses revoked. After a certain amount of tickets, these dangerous drivers don't need to go again to driving school. They need to be sent for psychological evaluations to determine if they can or can't control themselves enough on the road to not be hazards to those around them. I bet you're thinking that JoeSettler has passed 10,000 posts, or 10,000 readers, or maybe even 10,000 pageviews. I'm talking about Israel passing the 10,000 mark on the number of missiles and mortars fired on us from Gaza without effectively responding in kind. Caroline Glick write an important article which I recommend reading. This is not really an ad for Nefesh B'Nefesh's Go North program. I was reading YNET and there was an article about what NBN is offering to Olim that join the Go North program. "New Anglo olim settling in northern Israel will receive a NIS 100,000 ($25,000) grant and a car for a two-year period, as part of Nefesh B'Nefesh's new 'Go North' initiative, aimed at encouraging the immigration of English speaking Jews to Israel's northern communities. "Some $10 million were allocated towards the project. "Nefesh B'Nefesh sources believe most of the families would prefer jeeps or pickup trucks that are more suited for the northern terrain. "And if that's not enough, each immigrant child will immediately upon landing in Israel be given intensive private Hebrew lessons – free of charge. OK, if that isn't enough financial incentive to make Aliya with the Nefesh B'Nefesh Go North program, especially with the US (and US Jewry's) economy in such trouble, then I don't know what is. It's like winning the lottery. The Arab reaction to Muntadar al-Zeidi, the Iraqi journalist who threw his shoes at US President George W. Bush during a press conference in Baghdad on Sunday is all over the board. Some are for, some are against, but all the reactions are strong. I hope that one thing becomes clear to all these Arabs. If Al-Zeidi had thrown his shoe at Mubarak, Assad, Abbas, or some Saudi prince he would be dead or expecting to spend the rest of his life in prison. It may not have been the best use of one's right to freedom of expression, but in a typical Arab dictatorship that would have been the effective end of one's life. (I do admit, I wonder if any Israeli would dare do this to Barak or Livni, and what the punishment meted out in Israel would be). A University of Ariel study of Jewish residents of Judea and Samaria has come up with some interesting findings. 1. The Jewish population in Judea and Samaria is increasing at 3 times the rate of the rest of Israel. 2. The number of children per household is higher here than in the rest of Israel. 3. The average age here is younger here than in the rest of Israel. 4. The employment rate here is higher here than in the rest of Israel. 5. Jewish residents are more satisfied with their lives is higher here than in the rest of Israel. Muqata adds that Jewish income in Judea and Samaria is 10% higher than the average family income than the rest of Israel. (Jameel's source: Galei Tzahal). Well, you have to hand it to the State of Israel. They certainly know how to get rid of an offensive flag when they want to. No. I'm not talking about the Nazi flag waving right across from an IDF pillbox just south of Gush Etzion, hanging on the Israeli Electric Company powerlines. The Nazi flag there will keep waving in the wind as far as Israel is concerned. I'm talking about some stupid Jew from the Shomron, who thought that he can walk inside a city within Green-line Israel proudly holding an Israeli flag. Nope. That Jew was arrested and his Israeli flag confiscated. 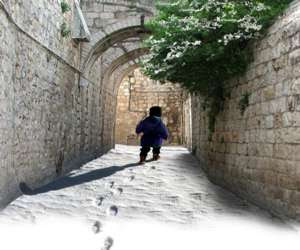 You see, the town in Israel he walked through is called Uhm el-Fahm. CORRECTION: The Jew from the Shomron was not inside Um el-Faham at all. He stood outside the entrance to the town! There the Israeli flag is considered incitement. I know people reading this are shocked, but personally I am relieved. Yes, it is insane, but at least the State continues to be consistent in its insanity. Imagine if everything was completely arbitrary, then we would have a real mess. Of course, the Jew from the Shomron was an idiot, he should have been waving a Nazi flag. Rabbi Shalom Dov Wolpe and Baruch Marzel are expected to meet Sunday afternoon to discuss the formation of a new right wing political party. So let's see. We have the (1) National Union that is breaking away from the "Jewish Home". We have (2) Aryeh Eldad's Haikva. We have (3) Effy Eitam who is still waiting for Bibi to reject his overtures. And now we have (4) the Jewish Front. If I do the math right, each party will succeed in not reaching the minimum threshhold leaving us without rightwing representation and at least 8 lost seats. Congratulations. Anyone else want to join the balagan. WHAT IS WRONG WITH YOU PEOPLE? GET TOGETHER AND RUN AS ONE LARGE RIGHT WING PARTY OR I WILL NOT VOTE FOR ANY OF YOU THIS TIME AROUND. Apparently what's good for the goose is not good for the gander. As expected, the police have decided to block the right wing march near Um El Faham. They claim it is due to expected violence. But the police did not block the gay parade in Jerusalem, nor the Left-wing protests outside of Jewish homes in Hebron - despite the threats of violence and incitement. You gotta love these one-sided decisions in the current state of Israel. How scary can you get? JP interviewed the American General Keith Dayton who is training the latest incarnation of the Palestinian army. He keeps repeating that the newly trained forces will not be used against Israel while proudly stating "Remember what I am emphasizing here. These are new security forces. They're the most capable you've ever seen." All I see are gonnabe terrorists who have now been very well trained by the US. I've seen this movie a dozen times. It always ends the same way. I've written about Western Wall Prayers in the past. 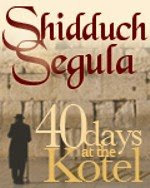 They have added a new component to their campaign called Shidduch Segula. This is the segula that I am personally very familiar with. Typically girls who want to get married go to the Kotel and pray there for 40 days asking to find the one. I know this, because my wife did that and met me on day 41 or 42 (no kidding). (I won't mention how many times she repeated this exercise until we actually got engaged). Of course, not everyone has the opportunity to go to the Kotel, so Western Wall Prayers gives you the ability to send a surrogate prayer partner to go to the Kotel for you. This doesn't absolve you of your own participation, as they expect you to say the Tehillim for 40 days too, along with them from where ever you are. As I've said in the past, I'm not into segulas, but I do believe in prayer and talking to God, so as far as I'm concerned prayer can only help. From what I understand, the money is going to help support the yeshiva students, rabbis, and others who are going to the kotel on your behalf, so you get a Tzedakah mitzvah at the same time. So if you want to find your Bashert (the "one"), and want to try praying 40 days at the kotel (a segulah which my wife fully endorses) but you can't, then check out Western Wall Prayers. (Applicable to both boys and girls). Feiglin has just showed that he is so much bigger than Bibi. Feiglin was interviewed on Mabat (Channel 1) and this is what he said. To begin with Feiglin said he has no intention of taking his case to the Supreme Court - even though legally he should win. First of all, because the Supreme Court is simply Left and he has no faith in it, secondly and more important, because he plans to enter the Knesset because of a large Likud and the will of the voters, and not because of some win in court. Furthermore, he said Bibi is just shooting himself in the leg. He compared him to Sharon, who also went against the will of the voters. Feiglin has chosen to not rip apart the Likud in a legal battle. He has shown that he is the leader that Bibi is not. There you go, it took some time, but Ehud Barak finally acted with determination. I don't know if you've seen his idiotic ads in the TA region, but they're idiotic. They're trying to portray him as some sort of iconoclast. A leader who bucks the trends. Hamas is about to collapse financially (supposedly, as we know how believable their claims are). They need money. They of course haven't release Shalit, or even stopped launching rockets at us. But our Defense Minister acted with determination. He sent them 100 million shekels to prop up their terror regime. No strings attached. There you have it. Sharon didn't respect the democratic will and rules of his party, and neither has Bibi. Bibi has pushed Feiglin down to position 35 or 36. So much for the democratic process in the Likud. But there is precedent for that in the Likud. As far as I am concerned, we learned our lesson with Sharon, and we shouldn't close our eyes to what Bibi apparently is too. Interesting article in A7 that discusses hard numbers regarding how the police do NOT treat Jews in Judea and Samaria the same as they do in the rest of the country. Quite unfair but not unexpected. The Left, the media, Kadima, Labor - they're all attacking you because the Likud is now leaning Right. Listen to them Bibi. They want a monolithic Left. They don't want choice. They don't want Change. They are afraid, terrified even, because you can now offer the people an alternative from their extremist path. The people are tired of capitulating to Oslo, tired of retreating from Kassams, tired of Olmert's failed utopian fantasy. The people want change, they want a strong Israel. The Left know that as long as the Likud looks like a Kadima clone then they have a chance. But if you pick up the gauntlet, they know they have lost. But here you are trying to shoot yourself in the foot and lose the elections. You don't have to embrace Feiglin, but you don't have to target him as your enemy. That is exactly what the Left wants. They know if you offer the people the same as they are, then there is no particular reason to vote for the Likud. Furthermore, trying to nullify Feiglin now shows you to be a weak leader, a leader who is afraid and petty. A leader who can't even control his own party, much less the country. Worse, a leader who won't play by the rules - just like Sharon, and someone who does that deserves no respect at all. Your actions are turning off your constituents and voters. Offer us change. Offer us something different. Act bigger than you apparently are. Keep going down the road you are on now, and Likud will continue to be a small, pointless, undifferentiated party, and you won't be Prime Minister. Bibi is out to oust Feiglin one way or the other. In his latest sponsored move, he is trying to have the regional seats moved up in the list (by 1 slot I'm sure), which would move Feiglin all the way from 20 down to the high 30s. Come on, have you no shame whatsoever? It must be good to be have a friend in the Supreme Court. Lose a case against a settler, just take it to the Supreme Court and it will be automatically reversed. Noam Federman won a case against the State (in a lower court) for illegally detaining and holding him for months on end. The State was forced to pay. The State (illegally?) only paid part of the money, holding out until they could get the decision reversed in their appeal to the Supreme Court. The Supreme Court of the Left obviously reversed the decision, and now is demanding that Federman pay back the partial payment he received. They will of course send him to jail if he doesn't give it back. I wonder what the precedents for that are? Jewish Communities can show their displeasure with what this government is doing by redirecting their fund raising directly to Hebron, the Settlement Organizations, and other targets of this Left wing government's ire. That kind of action causes major ripples among these big fund raising organizations, who then send feedback directly to their friends in the seats of power that they have managed to go too far. Nothing sends a message clearer than a donation to the right causes. This one is for all you "feedburner" readers out there. I just checked and to my surprise there are a lot of you. Who knew? What it does mean is that you don't see the ads on my blog, so I am giving you the opportunity to click on the ads without even having to go to the blog. The advertiser I want to talk to you about is called StartFresh. StartFresh is an online Kosher diet plan. You sign up with them, tell them your current weight, your desired weight, and they present you with 3 daily meal plans (full meals with recipes) for you to eat your way to a healthier you (I know I heard that phrase somewhere, must be some commercial). Anyhoo, I don't really need it myself, but I took a look at the "Sneak Peeks" on their site and I liked the recipe for Oriental Chicken and Vegetable Stir Fry. This clearly isn't some boring food diet, but one where you eat tasty stuff, but in the right portions and with the right balance. The site has a recipe library for members as well as holiday related recipes. So with Chanukah coming up, you want to look good in front of that Menorah. Check out StartFresh. They also have a FREE CD. Huh?! Who's in charge over there? What exactly is Tzippy Livni trying to prove? That she isn't qualified to lead this country? I can only assume she sees her statements as an attack on Barak (and not on herself) and not a statement on herself. But listen to these idiotic remarks coming from her mouth. "The strategic goal in my eyes is to prevent the establishment of an extremist Islamic terror state along Israel's southern border." Like the one that is already there? "If Hamas knows that Israel won't be quiet when missiles fall on Ashkelon, they will feel the responsibility on their shoulders." But they know you will be quiet. And Ashkelon? What about poor Sderot? "When we are faced with a decision to come to some kind of arrangement - like a ceasefire - which may seem in the short time a legitimate interest, we must remember that when Israel gets into these arrangements, they harm us and strengthen Hamas" Sort of like Hizbollah and Resolution 1701 that you are so proud of? Sorry. Just not Prime Ministerial quality. Well, that's interesting. I won't give a line by line analysis of the Likud's new list like Jameel did, but I will say it is interesting. The list is much more Right in the realistic spots than I expected. Feiglin is happy, though people were talking that he would be in the top 10, but still, he is in a realistic spot. I am unhappy that Dan Meridor is so high up on the list, but at least most of the other major Leftists Bibi brought in are low down. The question is, what will Bibi do next? Will he try to merge some 3rd party in and lower Moshe down? It's possible. Or perhaps he will run on the Center-Right ticket and leave the Left for Kadima-Labor-Meretz to fight between them. Has JoeSettler found a new political home? Elections are coming up, and in all the recent elections I have voted (quite happily) only for Baruch Marzel, but perhaps times are a changing. Let's look at what's available? Let's get real, Bibi is trying to stack the deck with leftists, and he is calling for a national unity government? Who needs that? We've been trying to throw those Kadima and Labor jokers out, not let them in the back door. A mixed up version of the washed up Mafdal? So we all wear a kippah, that doesn't mean they deserve my vote. Does the party of Lieberman and his 7 dwarves even have a name? Uzi Landau joined up? So what, he just wants a chance to be a minister which Bibi will never let him have from inside the Likud. Lieberman sat quite nicely with Kadima. Goodbye. I am seriously considering Hatikva. It is a right-wing party modeled after Gandhi's Moledet, though with some minor modifications. I am not so comfortable with its current dearth of religious representation, but there primaries are tomorrow so we'll see who is on their list. Furthermore, if Efi Eitam gives up wasting his time trying to merge into the Likud, he will find a home in Hatikva with a merger there. And I actually spoke with Aryeh Eldad, and he could be quite comfortable with Baruch Marzel (though assuming an Eldad-Marzel configuration doesn't kill them in the polls). Though Marzel is likely to go with R. Shlomo Wolpe's new party. Eldad-Eitam-Marzel: that could be a dream team. But even Eldad-Eitam would be quite satisfactory. BUT, I still want to learn more about Wolpe's party and see where Efi Eitam ends up. I would like to thank the tens of people who called and sent emails to ask how I was doing. Thank G-d I feel better and returned home after having been in the hospital. paralyzed me completely and the paramedics feared my neck and spine had been hurt. I was rushed to the Shaarei Tzedek hospital. Thank G-d, after different tests in the hospital all tests were shown to be ok.My body obviously hurts very much but that will pass in the next few days.My fighting spirit on the other hand has only increased and was strengthened after I had the honor to spend the entire last week, together with thousands of others, in Bet Hashalom. We had the honor to get to know the 14 wonderful families who have been living in Bet Hashalom for the past year and eight months and the many other activists from Kiryat Arba Hebron. I am telling you, there are not enough words to describe those wonderful Jews. They gave us the most incredible lesson in hospitality and in love and total devotion to the Land of Israel. In addition, I want to salute the wonderful hundreds of youth who came to Bet Hashalom and strengthen them. I would like to address the lies and disinformation coming out of Ehud Barak's office and being spread by the media. We are being told that the expulsion from Bet Hashalom went by "smoothly and was done within an hour". It is important to announce that this is a complete lie . The truth is that against all expectations, the expulsion from Bet Hashalom took them at least four and a half days. As you recall, many expulsion troops already arrived in the area on Monday and it was clear that they planned to do it Monday night. But thanks to the thousands of loyal Jews who came and stayed in Bet Hashalom, and thanks to the hundreds of youth who did not stay indifferent to the attacks by the Arabs, the planned expulsion was prevented and postponed. This lasted till Thursday. Every day over a thousand people stayed in bet Hashalom and the government, understanding that this is not going to be as simple as they thought, just added more and more troops to the area. In addition, the government did not expect that the planned expulsion would start such fierce demonstrations all over the country. There were daily protests all over the country by hundreds of jews outraged at the thought of the upcoming crime. I am convinced that had we managed to keep over a thousand people in bet Hashalom also on Thursday, the expulsion would not have taken place and may this be a lesson for us in the future. In addition, it is hard to say that the expulsion is over with. Yes, they managed to take us out temporarily from Bet Hashalom but since the expulsion there are demonstrations and disorder by loyal Jews protesting all over the country and hopefully this will just be the beginning. We must make sure that the government pays a heavy price for the expulsion of Jews so that in the future they will think twice if this is worth it for them. The message is clear: If it took so many days and so many forces to expel Jews from just one house-don't even think you will ever again be able to uproot Jews from an entire community. In addition to the protests all over the country, the bet Hashalom residents have already announced that they plan to go back to Bet Hashalom today, even if it means living in tents in the vicinity. I am writing those words the day after the expulsion from Bet Hashalom. I am sure that in the next few days we will have many more conclusions and thought about what happened here so we can learn for the future struggles. In conclusion, the expulsion forces who behaved like brutal violent monsters indeed managed to bruise our bodies but we are the ones who please G-d will give them the final blow. Our main revenge will please G-d come on February 10, election day, when the people of Israel will expel this anti-zionist, anti jewish bolchevic regime and will bring to power a national government. Let's just hope that this time, the new elected leaders will not disappoint us and will really be loyal to the Land of Israel, the People of Israel and the Torah of Israel. The police have begun violently evacuating the Peace House. Of, relating to, being, or imposing a form of government in which the political authority exercises absolute and centralized control over all aspects of life, the individual is subordinated to the state, and opposing political and cultural expression is suppressed: "A totalitarian regime crushes all autonomous institutions in its drive to seize the human soul" Arthur M. Schlesinger, Jr.
"A country cannot have negotiations about its control over its citizens." Ehud Barak. The words coming from various government official and Ehud Barak in particular should strike fear in the hearts of every member of democratic society. Every statement is how the settlers are a danger to the State, how the State must be protected from the Settlers, how the State take precedence over all. The State exists to serve the citizens – in a democracy. But in a totalitarian regime, the citizens are there to serve the State and follow the orders of its leaders (and they tend to remain in their seats of power for a very long time, sound like any local government you know of?). But what about the Right of the Individual? In a democracy, the Rights of the Individual is foremost, and only curtailed with trepidation and much discourse. You would think that one word on the rights of the individual to buy property would be part of the discussion here, but of course it isn’t. Instead what is discussed is that the individual using what should be his basic right to buy, own, maintain, and utilize his property is considered a threat to the very existence of what is now an apparently very fragile State. But I have a surprise for you - Ehud Barak is right. If Israel were a healthy democracy, then Jews buying land would never be considered an existential threat, but if Israel were a totalitarian regime with power being shared and rotated among the same individuals decade after decade, and some private citizens came along and utilized what should be an inalienable right, except under a totalitarian regime, then yes, those people would be a threat, but not the country or its citizens, but rather those clinging to their seats of power over the rest of us. As Barak says, a State must control its citizens. There's no better description for what kind of government we find ourselves with. It looks like negotiations have broken down. Barak is not looking for any reasonable solutions within the letter of the law. Ahead of elections, he wants to prove to his dwindling constituency that he is tough on somebody, and since he isn't tough on the actual enemy, it might as well be the settlers. Maybe he is trying to get rid of his Barak Barach nickname ("Barak ran away", which he has done on a number of occasions). From here it looks like he will try to expel the residents on Shabbat when they won't be able to call for local reinforcement from the surrounding communities. I only wonder how many settlers has he ordered to be shot during the expulsion - and I'm serious with that question. Reports are coming in that the army is pulling into Hebron right now with Bulldozers. Peace (House) in our time? I just got back from the Peace House and I am trying to reach some conclusions. I watched the “Hilltop Youth” today sitting in the main hall learning Gemorah, where just yesterday they were defending this stronghold and our right to be in Hebron - and Israel itself. Some younger kids were acting up violently on the road outside, until the adults put an end to their shenanigans. This evening was calm (though a friend of mine was arrested this morning in another event in Hebron – I happened to actually see that on a video on the internet). I don’t think the police or the army were ready for yesterday at the Peace House. I suspect they figured that at worst it would be like Amona, where for the most part they got to break Jewish heads freely. I suspect the police and army understand that if they continue in the direction Barak is forcing them to take, there will be a civil war long before Barak has a chance to lose any more seats than he has already. I think it’s safe to assume that responsible leadership on both sides spoke today and decided to have the government forces back off before something irreversible happens. I am sure that a unilateral decision like that annoyed Barak, as something irreversible is exactly what he is hoping for. Will the expulsion actually happen? Based on yesterday I would say it is slightly less likely. This won’t be a Gush Katif or Amona. The price for the Peace House is now far higher than the responsible members of the police and IDF are probably willing to pay. But then again, you have irresponsible politicians like Barak, who see this as a way to win Brownie Points from their dwindling number of constituents. And then you also have members of the police that would be murderous sociopaths today if they hadn’t gotten a uniform which make certain actions socially acceptable. Clearly if one of those is in charge, we can still expect bad things. A lot remains to be seen before I can draw some proper conclusions which I may try to do in another post another time. Things are heating up at the Peace House in Hebron. Hundreds of Jews from all over are converging at the location, as the city is filling up with Yassam and Magav soldiers/policemen. Extreme police violence is expected. 11:25 Police on loudspeakers are shouting orders. 12:02 Police shooting teargas, rocks being thrown, Arabs throwing rocks. 12:24 Police not doing anything right now. The local army base is packed with forces. 3:00AM Police shoot rock grenades and tear gas. It's a regular war zone. Cameraman catches on film a policeman beating up a settler boy. Generally assumed that the police did not go in to evacuate the house was due to the resistance they met outside. Amira Hass, a Jewish Settler who lives in Ramallah traveled by boat to Gaza the other day. Upon arrival she was informed by the Hamas government that she must leave Gaza immediately. She returned to Israel occupied territory today.